Kinohimitsu is the No. 1 Functional Drink in Malaysia & Singapore. Kinohimitsu is under Kino Biotech. In Japenese Kino means plants and Himitsu means secret., “Secrets of Plants” . It’s a Singaporean based company, R&D is in Japan and manufacturing was in Japan before, but initially moved to Taiwan. 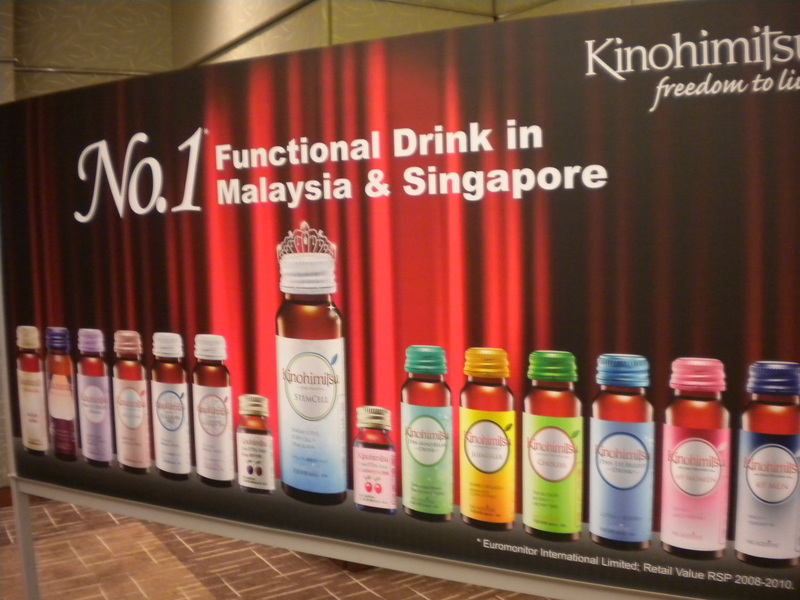 Kinohimitsu, has won awards in Las Vegas and London (Best targeted health drink). We were greeted by their friendly reception, we had to register ourselves before we attend the event. After the registration, we had to try two (2) different collagen drink and tick which one we liked, the pink tag or the yellow tag. I personally liked the pink tagged one (the orangy looking drink above in the picture). Apparently, they were testing the market and in the end of the event they announced that majority chose the pink tagged one, which is from Kinohimitsu brand. 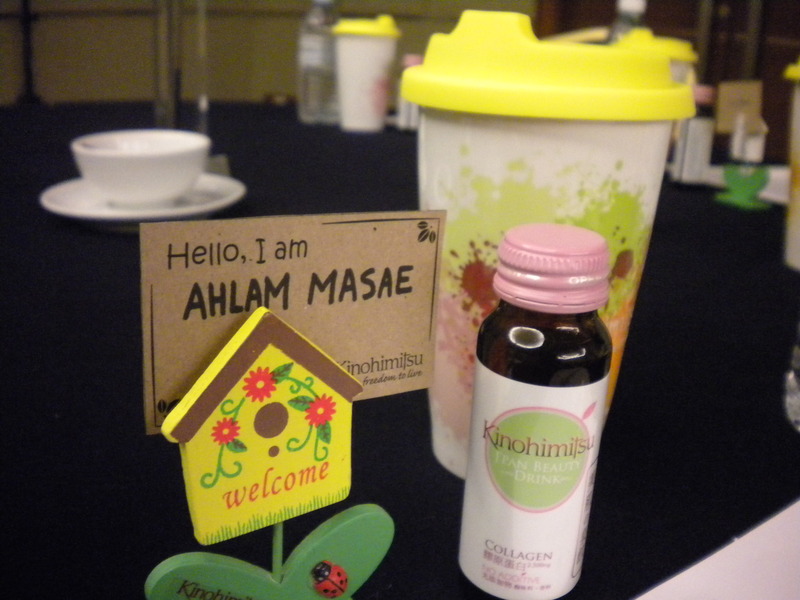 When headed to our table, I saw my seat personalized with my name tag, mug and Kinohimitsu Collagen drink. I love the fact that our table had blueberries for snacks, it’s good for anti-oxidant, so I snacked all the way, hahaha..
Collagen is like a spring in a mattress that determines the skin’s firmness and suppleness. In between the spring, it is the moisture content. When skin lacks of moisture, the skin starts to wrinkle, which cause saggy cheeks, droopy eyelids, flabby arms and so on. Why should we drink Collagen ? We need to drink collagen, because our body starts to lose collagen from the age of 20 years old and loses its peak on the age of 25 years old. Loss of collagen can cause our body to cripple and cause wrinkles on our body when we get older. Because it loses the firmness, dehydrates and our skin becomes non-elastic. Collagen can plump up and hydrate skin. It also can help in cell renewal, while reducing and preventing the onset of wrinkles. Supplementing Collagen can prevent ageing, allowing our skin to look beautiful and young. Why should we choose Kinohimitsu as our brand ? 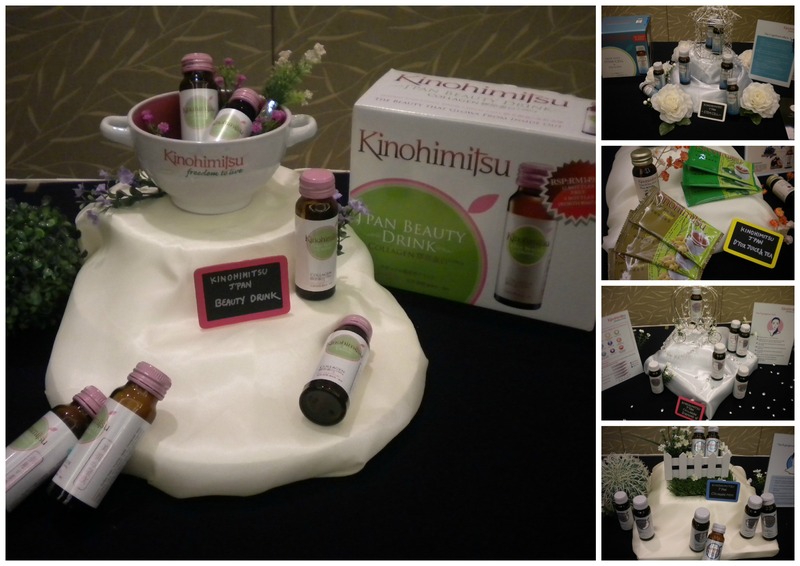 Kinohimitsu use the best ingredients and technology. Their proprietary liquid formula supports high absorption, because of their advanced technology and renowned methods for healing. Kinohimitsu provides the highest grade marine collagen (fish from France), extracted through advanced technology, the collagen is in high quality and purity , contains no fat and cholesterol. Each Collagen peptide molecule is small and easily absorbed by the skin. It helps to boost Collagen synthesis at dermis layer effectively. The Kinohimitsu Collagen drink is very tasty, as they use they most advanced technology, because technology does make a difference in the taste of the collagen. 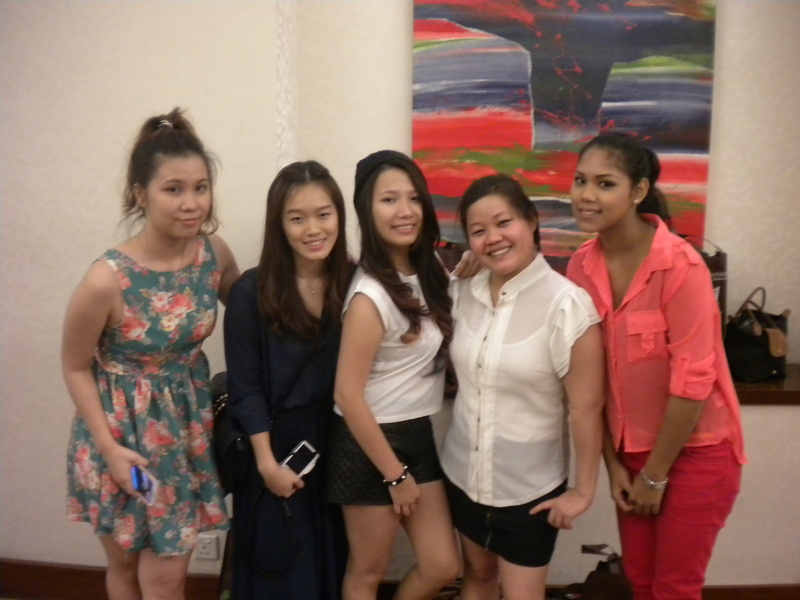 With the other bloggers, we were the most noisiest table, from left to right Carina, Alice, Angeline, Tanya and Me. Ofcourse, I didn’t leave empty handed. They gave me Kinohimitsu J’Pan D’Tox Juice & J’Pan Beauty Drink to bring home and to try out. At the end of the event, I received a certificate of participation from Kinohimitsu. For more information on the Kinohimitsu Brand visit their Facebook Page and their official website. You definitely can take it, and no it wouldn’t affect your period. If your pregnant it still should be oke to consume because certain food still contains collagen. But I do advise not to take more than you suppose to in a day..
my age 20..can i try it??? which one i have to try? ?diamond or uv bright??? Thats up to u, I would prefer uv bright, cuz diamond is for older age women..
ok..but if i stop take this splment, it can give any effect for my body??? hai..im 23.. which product suitable 4 my age.. i have a problem in acne also..